Cost effective solution for vehicle turning angles. Turning Templates operate in any CAD environment and are used by transportation and traffic engineers in the design of roadway facilities involving vehicle access evaluations. Turning Templates can be used for projects such as: roundabouts, intersections, loading bays, gas stations, parking lots and industrial/commercial facilities. 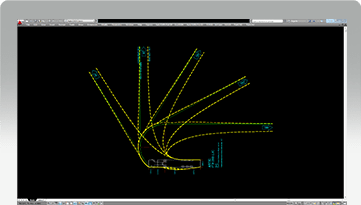 Produced using AutoTURN® software, Turning Templates adhere to selected regional transportation agency design standards from North America (AASHTO, CALTRANS, TAC), South America, Europe, and Asia Pacific. Why Choose Vehicle Turning Templates? CAD turning templates are an affordable solution for elementary roadway and site design projects and work in virtually any CAD platform environment. Just install the turning templates to your system and you can start working immediately. Do more with AutoTURN Lite Looking for a more effective, yet still affordable vehicle simulation software? 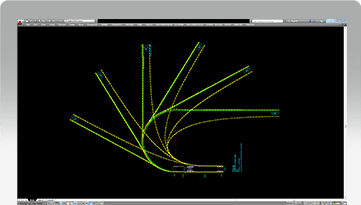 AutoTURN Lite is a low-cost, entry-level vehicle turn simulation software for modeling basic maneuvers. With just a core feature set, AutoTURN Lite will have you up and running vehicle simulations quickly and easily. 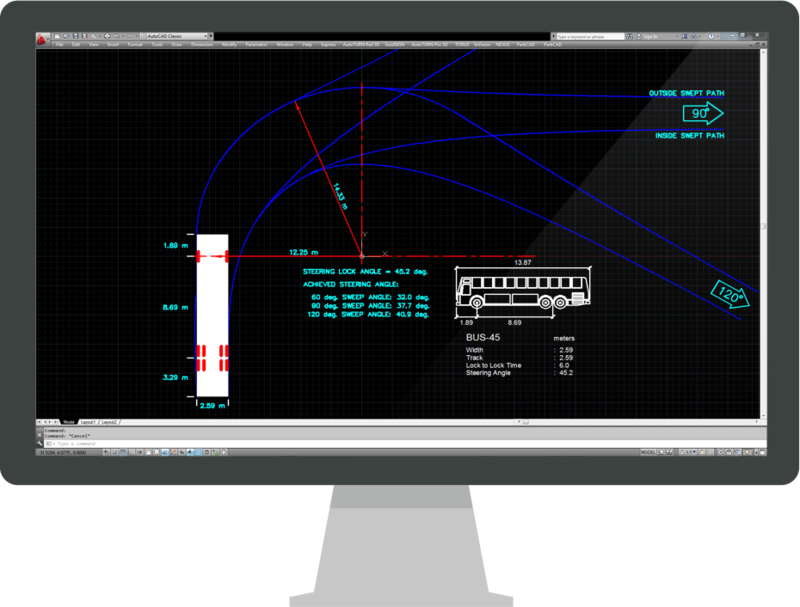 Looking for a more effective, yet still affordable vehicle simulation software? Try AutoTURN Lite today. Operates in Autodesk AutoCAD® and AutoCAD® LT, Bentley® MicroStation®, BricsCAD®, IntelliCAD®, CADDIE®, ZWCAD+® or any CAD program that reads .dwg or .cel file formats.